Just an update regarding my Aunt Lucy Quilt. I have finished quilting and binding her. 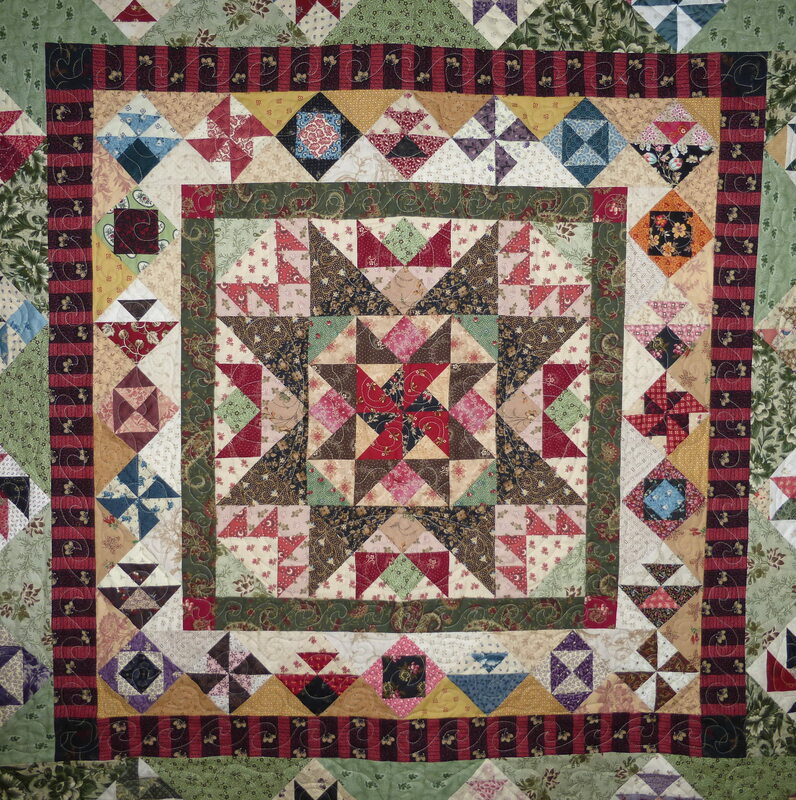 The fun thing about this quilt is that it has a wonderful collection of Reproduction Fabrics. This was possible because I participated in a block of the month program at Quilter’s Common in Wakefield, MA. Thus I did not have to purchase one bit of fabric more than required and still got this wonderful scrappy quilt. The quilting was a bit of an adventure for me. I printed patterns that I sized to fit the blocks and borders and used the laser light on my longarm machine to trace them. This is the second time I have turned a quilt to do the borders. I did a test run with a little panel quilt (that still needs a binding). I am happy with the results. 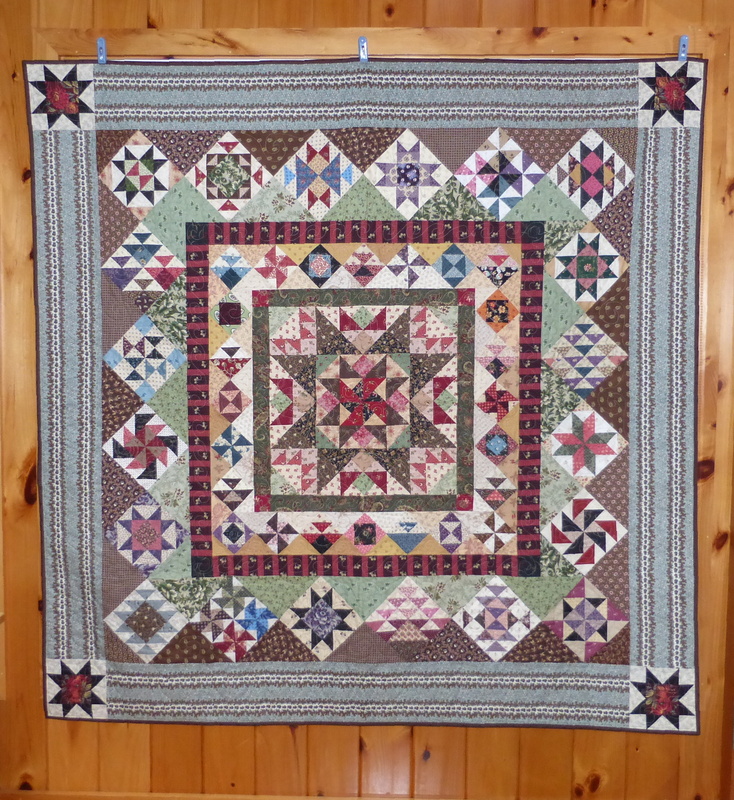 This entry was posted in Fabric, Patterns, Quilts, Vintage and tagged aunt lucy, follow the line, medallion quilt, Quilters Common, quilting, reproduction quilt on June 5, 2014 by pmegio. I just love the colors in this quilt. If this quilt does not make you happy I don’t know what will. The fabric is a Hoffman Watermelon Bali Pops pack of 2 1/2 inch strips with two light green and two lavender fabrics substituted. Sorry to say that this color set has been “retired” and I could not find it even on e-bay. Perhaps Wildberry or Splash will make you just as happy! The pattern is Champagne from Villa Rosa Designs. The pattern was written with a pack of 2 1/2 inch strips in mind. These patterns are very basic, printed on a post card, but are only $2.00. I added borders to the quilt to make is a nice size for keeping warm while watching TV or reading. Thanks to Colette at Quilters Common for help choosing the fabric for the borders. She was right of course! This entry was posted in Fabric, Patterns, Quilts and tagged bali, champagne, hoffman, patterns, pops, villa rosa, watermelon on November 1, 2013 by pmegio. Peggy Anne’s Quilting and Sewing is selling Voile! Buy some and make a voile scarf for your self and for a friend. 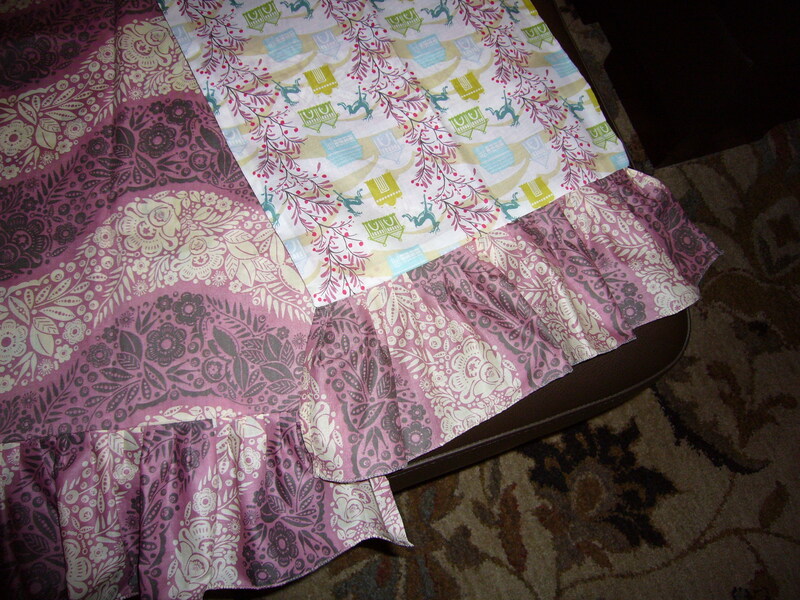 These voile fabrics are silky smooth and easy to sew with … and I even used some to back a quilt. There is more to life than quilting cotton, yes there is!!! 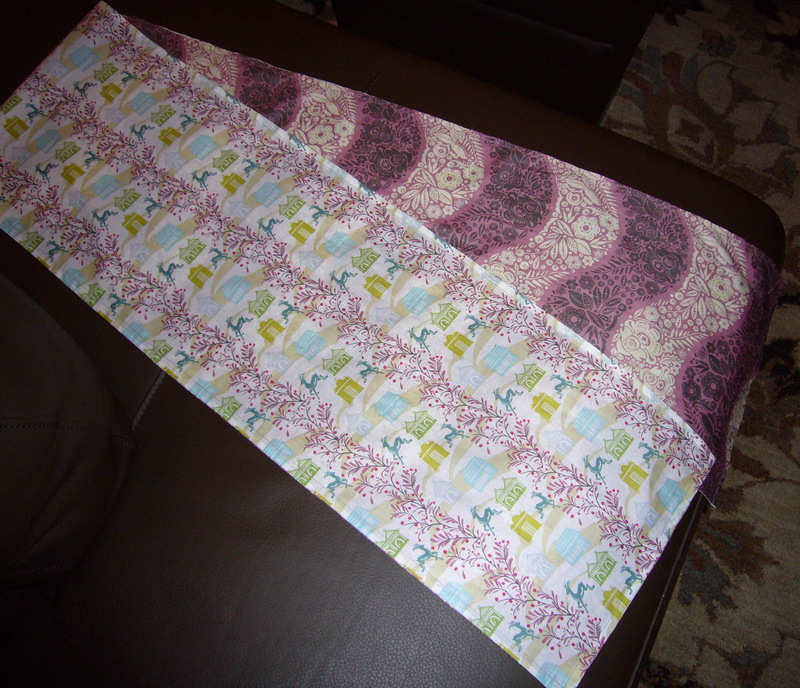 This entry was posted in Fabric, Sewing and tagged cotton voile, voile, voile scarf on January 18, 2013 by pmegio. When I was in Nobleboro Maine this summer taking a Denyse Schmidt class at the Alewives shop I noticed their infinity scarf kits. They have a kit that uses the same fabrics as used in the velvet throw. They also offer a kit for a scarf made with two pieces of the cotton voile. I just love this fabric. It is very silky and the colors on the reverse of the fabric are nearly as sharp and bright as on the right side of the fabric. With this in mind I decided to make a more finite version of the scarf by sewing the two pieces of fabric down the middle with a French seam. This worked out very nicely! The scarf folds at the seam and wraps around your neck or ties in a nice knot. The trick is to do the French seam in reverse, so to speak. Start with the right sides together to get the scarf to fold down the middle and lie flat with the right sides up when finished. While it is true that you can’t notice the difference between the sides easily, there is a bit of a difference, so if you are particular you will want the right sides up! Voile-Lahhhhh … you have a voile scarf to enjoy! Hopefully these pictures will help to get the idea across for you! To make this scarf I bought 2 yards of 2 fabrics so that I would not have to piece two lengths of fabric for a 72″ long scarf. 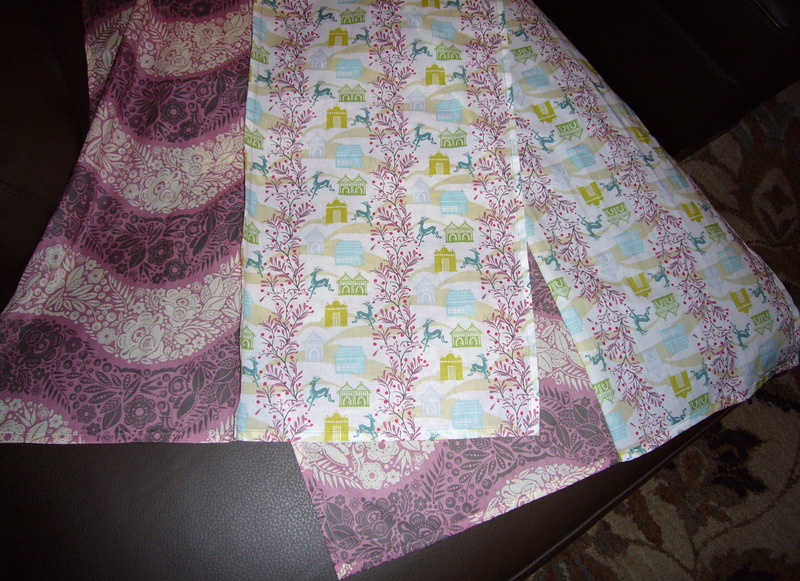 Of course, this voile fabric is 54″ wide, so that means I can make several scarves for gifts! I decided to try a different version for one of these gift scarves. This one uses my new Ruffler presser foot. Very girly! This entry was posted in Fabric, Sewing and tagged cotton voile, scarf on January 18, 2013 by pmegio. I have been using the Draw Free app to draw designs for Spoonflower. Admittedly, they are not the most sophisticated designs, but it is too much fun to resist. I put a whole set together and ordered 8″ square swatches, 15 for $20. I’ll have to put a little quilt together with them. Here are some of the fabric swatches for my designs. I have also included screen shots from the Draw Free app so that you can compare the designs to the fabric swatch. The colors came out pretty close to the drawings considering that I did not do any color editing. This entry was posted in Fabric, Sewing and tagged draw free, fabric design, spoonflower fabric on December 16, 2012 by pmegio. I have been having quite a bit of fun turning my little bird appliques into fabric on Spoonflower. Spoonflower allows you to create your own fabric. It’s pretty easy. All you have to do is upload an image and you are a fabric designer. Too fun! You should try it. Here are pictures of my fabrics. You can check out my Spoonflower shop if you are interested in buying some of these fabrics. This entry was posted in Fabric, Quilts, Sewing and tagged applique birds, spoonflower fabric on November 9, 2012 by pmegio.